I know this has probably been done a million times, but I'm proud and wanted to show it off as well as give the community an inexpensive option! I'm kind of curious since i'm not looking for tons of bass, but more just something to add depth to my music. I've been looking at under seat soloutions since i don't want to lose trunk space if at all possible. At lower speeds the bass really fills out the sound of the component mid and highs, but as usual at freeway speed (65+) it gets a little lost and i need to turn the volume up. Are the spare tire tools still in there? Was waiting to purchase one of these on eBay. Just wasn't sure of the quality. It's $72 shipped. Pretty good deal. Same company, but different box. I went with the more expensive box because it has a grill for the sub so you can still use the trunk without "stuff" damaging the sub. If you don't care about the sub being exposed to possible damage I'm sure the quality is just as good on this version! Buy with confidence these guys make good stuff! Sound about right. I just looked again and noticed the amp thing. Yep, doesnt make a lot of sense to carry around tools but no spare . Looks very similar to the Stealthbox sub enclosure. The next time I'm in Richmond, we'll get together and I'll show you my setup with the Alpine and the Stealthbox. 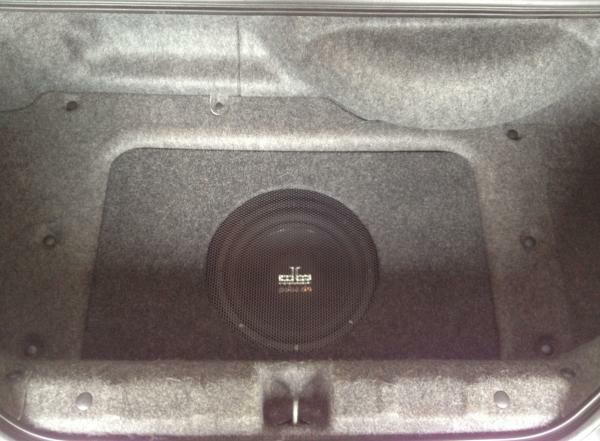 The Stealthbox is a sealed enclosure system which gives pretty decent bass. I sold my 600w mono amp (a 1kw mono is on the horizon) so I'm only driving it with 250w at the moment but it's still delivering decent bass. kgf: I looked at those and liked them better, but didn't want to spend the $600. Install looks good. Wish I could do one...cant give up the space. Last edited by starrman; 04-03-2012 at 03:10 PM. Wish I could do one...cant give up the space. Its the only spot deep enough for most suitcases. Or a case of wine. 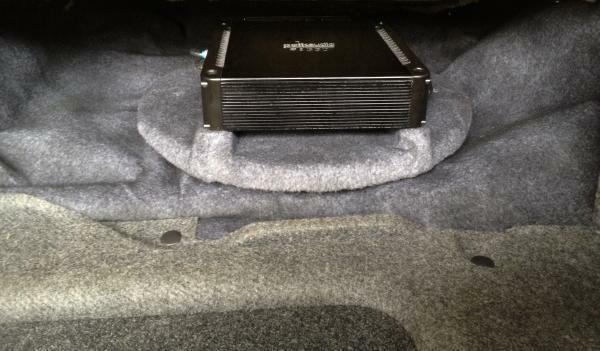 So I've been looking into a CRV subwoofer to put under the seat. I think it might work depending on the dimensions. I think it's slim enough though. Nice find and nice install. I have been debating wether or not to put sound in the s, I have a critical mass ul12 sitting in my bedroom begging me to do something and it is (in my opinion) the best subwoofer for the s. why?? Well it can handle 2500 watts of clean power (you need power to overcome the road noise at highway speeds), works well in small sealed enclosures (no explanation needed for this one), and best of all it weighs in at just a touch over 16 lbs oh and it is also held in very high regard for its sound quality. Sooner or later I may go for it. Stinks you lose access to the jack and spare tire etc. 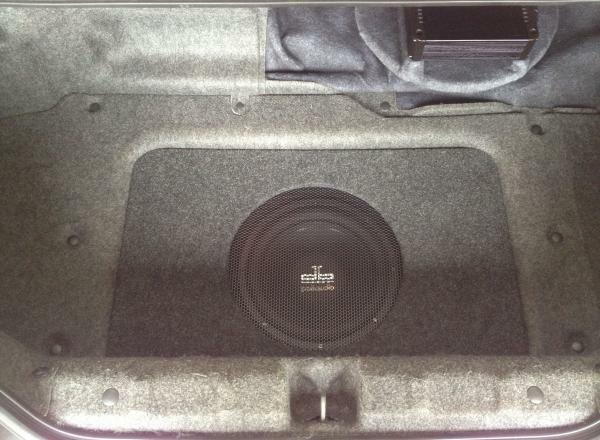 It's amazing how much bass is able to come through, through the seat backs (i.e. over the gas tank and through the spare tire well) and still sound awesome. How is it with the top down? How did you make the amp rack? Did you use the extra stuff from the tools for the spare? I have the same concerns with the loss of space but it's because I do 5-7 day road trips every year and it's hard to fit two peoples stuff in the trunk of the S2000 as it is. I have in three summers and 57,000km never touched the tools and have never had a spare tire. The way I look at it is if you had a big brake kit the spare wouldn't fit anyway. Got a question to get some opinions on. Just got my S2000 and was wanting to add a sub into the well. Ive seen boxes built for it and everything but I was wanting to approach it another way. Would I be alright by fiberglassing the bottom and then building a top panel to mount the sub to and fiberglassing it in as well and making a permanent enclosure. I have no plans of ever carrying anything back there and was wondering. If anyonecan help please do so and it would be much appreciated. Also I do plan on building a cover panel with a screen in it to cover the sub. It's your car, you can certainly do that if you wish. The only thing you might want to consider is that one day you might want to sell the car and you'd have no way to remove the sub. While you may think it adds a lot to the car, someone else may think not. That's why people use sealed, custom enclosures. They can be removed. Being as there is so little storage space as it is, I would certainly not make a permanent installation, especially fiberglass. Acoustically it isn't going to do anything and it is pretty messy stuff to work with. If you wanted it to be clean looking after the install you would have to remove the carpet. I really appreciate the recessed part of the trunk. I found a suitcase that fits into it perfectly. Two of us lived out of the trunk for over two weeks last summer no problem. If you tape off all areas that you plan to glass, you can paint turtle wax over the tape and be able to remove the enclosure after glassing the top into the bottom. You have to make sure it's air tight. I've made several stealth enclosures in my Camaro' s and my Jeep. The problem is getting enough air volume for the sub to work well. You are also limited in the size sub you can squeeze in that hole. There is so much noise in my car that I don't think it's worth the effort without proper amplification of the woofers and teeters inside the cabin. Unless I wanted to use the whole trunk I wouldn't do it. The S is a poor music environment. I personal prefer the sound of wind. Last edited by Charlie Croker; 12-31-2013 at 08:35 PM.